Me: When was the last time you said I Love You to me? Freaking long time ago right!!!!!!!!!!! after 10 mins, I received a sms reply from hubs. Hubs: Everyday! In my heart, you cannot hear. When I was tucking Ryan in bed…. Mommy: Ryan, it’s very late now. You better get some sleep. After 20 mins my boy was still awake, tossing and turning in the dark. Ryan: Mommy, what you doing? How about mommy close eyes? Ryan: How about hold hand mommy? Mommy: OK la… (and we held our hands in dark…heehee..) ..
Mommy: Ryan, you better sleep now else mommy will go out and you sleep alone here! See, I’m only a ‘xiao nu ren’ (??? ), small little thing like this puts a smile on my face…..
A short clip of Ryan’s phone conversation with Daddy earlier. I was about to tuck Ryan in bed when the call was made. I try to cultivate a habit for Ryan to wish everyone goodnight including Daddy even if he’s not home yet. Tonight was no exception. It’s always hilarious seeing his gestures when speaks on the phone. But tonight he was able to hold a conversation longer than I expected and it was so funny seeing him swapping phone from ear to ear as if he had spoken hours on the phone. He was telling his Daddy about the missing illuminated moon on the wall, daddy’s at work, that he must big hug kakak before bedtime (he usually hugs everyone goodnight, if Daddy is at home Daddy will even get an extra kiss, as for mommy, needless to elaborate. Heehee…), etc….. Only regret is I wasn’t able to capture the moment on a proper videocam/digicam. My phone was the most convenient recorder I could grab hold of at that spur of time. So hate the annoying buzzing sound in the background. Maybe it’s time for a new phone..
My helper took her off day yesterday. I had initially allowed her to take Sundays off (once a month) but due to my recent discovery on her lifestyle, I decided to scrap that. I will have a separate juicy post on that. Anyway, yesterday afternoon I decided to bring Ryan out to United Square. It was my first time out with Ryan alone. I was a little hesitant at first but I bite my tongue and went ahead as planned. I was so determined to get hold of a watering pot for him. Die die must go. That’s me. Always so kan cheong. Unfortunately luck was not on our end. I searched the whole complex and found nothing appropriate. So I went to do some groceries shopping at Cold Storage instead. Ryan behaved really well, very cooperative all along. After my groceries spree, we stopped by for some kiddie rides and playground fun. We saw a Japanese girl from afar, around the age of 4+ running around, disturbing and blocking other kids from going up the slides. What a spoilt brat! Not surprisngly she did the same to Ryan. When Ryan was going up the stairs on the slides, she purposely pushed Ryan away and sat right in front of his path. When Ryan was sliding down, she walked up from the bottom of the slide and refused to budge leaving Ryan stucked in the middle. Such a nuisance endangering the life of others and herself. 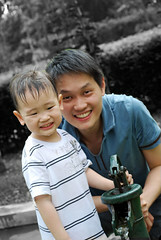 As much as I was very unhappy at the sight, I told Ryan to be patient and suggested he play with other activities. He was visibly disappointed but was well mannered enough to give in for other activities – ‘wheel twisting’. That Japanese girl continued her antics while her mommy just stood there like a tree, not moving an inch. How could a playground fun be complete without going down the slides right. Simply irresistable but Ryan simply could not enjoy any spur moment of fun without getting interrupted. From her expression, she finds joy in upsetting others. Another mommy was so afraid of letting her 18 mo girl near her and decided to just sit aside. I was upset with the girl, but I was more disappointed with her mother for not making an effort to manage the whole situation; her kid. Kids being kids, they can be rough and I could totally understand that but that doesn’t mean the parents/guardian could keep a blind eye on their actions. A few times she almost pushed Ryan down the slides because she was impatient. Ryan kept saying ‘excuse me, excuse me’ only to have his plea fallen on deaf ears. I can see other frustrated mommies were already exchanging glances. One hand I was telling Ryan to ‘share and take turns’, afterall this is a public amenities but deep down I so want to confront her mom telling her to at least manage her daughter! Anyway, I did not. I swallowed my frustration and continued keeping a close eye on Ryan. Don’t want to create a scene ma…. The final straw came when Ryan was at the ‘twist the wheel’ section again. This girl came and pushed Ryan away. Ryan looked at me and I again said ‘let’s share’ (I was boiling mad by then). This girl was so inconsiderate and possessive that she doesn’t even allowed Ryan to put his hands on the wheel. By then I could not take it anymore. I walked up to the girl, told her politely ’Girl, please share with your friend, okay?‘. She ignored me and pushed Ryan right under my nose. Wahhh… I cannot tolerate further. I was soooo soooo mad. I held on her hand and firmly said ‘NO.. no pushing, you’re hurting your friend here.. please share‘ then I took a glance at her mommy and summoned her to look after her girl and not allowing her to hurt other children. Guess what. She treated me like an invisible air. I don’t know whether she understands me or not. She stared at me blankly. I could explode anytime. By then, Ryan’s patience reaches its limit. He insisted playing and the girl continued to push him away. Ryan started crying. Poor boy. I quickly pulled Ryan away, said ‘PLEASE BEHAVE‘ and showed the NO sign language to both mother and daughter. I was dumfounded to see the mother unperturbed. I assume she doesn’t understand English but seeing your child bullying her peers, anyone with the right state of mind would have acted sanely right? It was as if nothing has happened despite seeing a boy crying because of her daughter’s action. Disappointed! This website call Schumacherhomes caught my attention. I was a big fan of Michael Schumacher until he announced his retirement two years ago. Nevertheless when I bumped into the name of this website I couldn’t resist taking a look only to be greeted with pleasing surprise on how some of the beautiful homes are designed. These homes are custom designed to suit ones’ individual taste, needs and wants. Looking at the designs it’s barely believable one could have a dream house at affordable fees but that’s what Schumacherhomes promise you. If you think your home needs a makeover, hop on to Schumacher Homes Press to find out more. Oh in case you’re wondering, no this is not Michael Schumacher’s new venture. 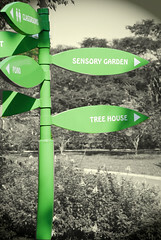 We went to Jacob Ballas Children’s Garden on Saturday – Asia’s first children’s garden. We have heard so much about the place but never got the chance to visit. It’s always zoo, zoo, zoo during the weekends (Ryan’s favourite). Weather was kind on us that morning. We reached there about 9am and the morning sun was shining bright down on us. Places like this is usually packed with people during the weekends but luckily we got there early. There were still ample parking space available. 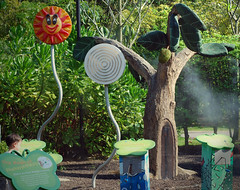 We were greeted by the water play area as soon as we entered the garden. The area was already packed with kids. We could actually hear the kids’ screams and laughter at the entrance. Ryan too wanted his share of fun but we convinced him we will be back for more after checking out the rest of the areas. We stopped at the photosynthesis exhibit next. Ryan was definitely captivated and refused to leave. He kept cranking and cranking the handles of the various stations (sunlight, carbon dioxide, water and phosynthesis). His favourite was the photosynthesis station which releases mist as he turned the handle. It’s pretty amazing. We walked around for another 30 minutes or so. 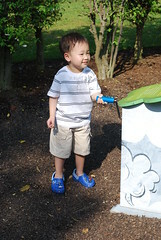 We visited the A -maze – ing Play, Sand Play, Match the Plants & Animals, Playground and Water Play. We actually thought we combed the whole garden. At least that was what hubs convinced me but we later found out we were actually far from it. There are still at least another 4- 5 attractions in the vicinity to cover. We went back to the Water Play area. Ryan absolutely love water. The Aqua diaper and extra clothing we brought for Ryan proved to be a wise decision. 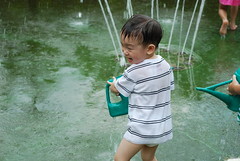 By 10am, the water play area was full of kiddos running around, showering under the water fountains, queueing for water at the manual water pump. Ryan had such a great time there. The few watering cans available there were such a scarce. Literally all eyes were on them. It’s like now you have it, now you don’t. Ryan was visibly longing for one. Poor boy. But thanks to another kor-kor who voluntarily gave up his and passed it to Ryan. Oh-so-sweeeeet. At night we went to Ngee Ann and Paragon. 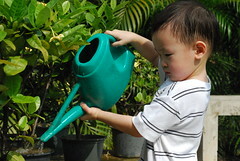 We wanted to get a watering can for Ryan so we could bring along the next time we go for water play. The trip down town was a futile trip. The place was jam packed with shoppers and simply too crowded to stroll along serenely. We went home empty handed. Who says economy is bad…..?? We didn’t do much on Sunday. We wanted to go zoo in the morning but we overslept and since hubs wanted to catch his live F1 telecast at noon we decided to stay in. At night we went to this cosy Forture Seafood Restaurant along Bukit Timah Road for dinner. Their Salted Egg Yolk Crab is one of the best we have tasted. Yummyyyy…..